Not to be confused with the Dominican Republic. "After God is the earth"
Dominica (/ˌdɒmɪˈniːkə/ dom-ih-NEE-kə; Island Carib: Wai‘tu kubuli), officially the Commonwealth of Dominica, is an island country in the West Indies. The capital, Roseau, is located on the western side of the island. It is part of the Windward Islands in the Lesser Antilles archipelago in the Caribbean Sea. The island is located near Guadeloupe to the northwest and Martinique to the south-southeast. Its area is 750 km2 (290 sq mi), and the highest point is Morne Diablotins, at 1,447 m (4,747 ft) in elevation. The population was 71,293 at the 2011 census. The Commonwealth of Dominica is one of the Caribbean's few republics. The island was originally inhabited by the Kalinago and later colonised by Europeans, predominantly by the French from the 1690s to 1763. Columbus is said to have passed the island on Sunday 3 November 1493, and the island's name is derived from the Latin for "Sunday". Great Britain took possession in 1763 after the Seven Years' War, and it gradually established English as its official language. The island republic gained independence in 1978. Its name is pronounced with emphasis on the third syllable, related to its French name of Dominique. Dominica has been nicknamed the "Nature Isle of the Caribbean" for its natural environment. It is the youngest island in the Lesser Antilles, and in fact it is still being formed by geothermal-volcanic activity, as evidenced by the world's second-largest hot spring, called Boiling Lake. The island has lush mountainous rainforests, and it is the home of many rare plants, animals, and bird species. There are xeric areas in some of the western coastal regions, but heavy rainfall occurs inland. The Sisserou parrot, also known as the imperial amazon and found only on Dominica, is the island's national bird and featured on the national flag, which is one of only two national flags containing the color purple (the other being Nicaragua). Dominica's precolonial indigenous inhabitants were the Island Carib people. They had named it Wai‘tu kubuli, which means "Tall is her body." Christopher Columbus, sailing for Spain, named the island as Dominica, after the Latin term dies Dominica for Sunday, the day on which the Spanish first saw it in November 1493. Some Spanish colonizers settled here. But, as European explorers and settlers entered the region, indigenous refugees from surrounding islands settled Dominica and pushed out the Spanish settlers. They went to other areas that were easier to control and had more natural resources. Spain had little success in colonising Dominica. In 1632, the French Compagnie des Îles de l'Amérique claimed it and other "Petites Antilles" for France, but no physical occupation took place. Between 1642 and 1650, French missionary Raymond Breton became the first regular European visitor to the island. 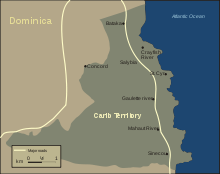 In 1660, the French and English agreed that Dominica and St. Vincent should not be settled, but left to the Carib as neutral territory. But its natural resources attracted expeditions of English and French foresters, who began harvesting timber. In 1690, the French established their first permanent settlements. French woodcutters from Martinique and Guadeloupe began to set up timber camps to supply the French islands with wood, and they gradually became permanent settlers. They brought the first enslaved Africans from West Africa to Dominique, as they called it in French. In 1715, a revolt of "poor white" smallholders in the north of Martinique, known as La Gaoulé, caused settlers to migrate to southern Dominique, where they set up smallholdings. Meanwhile, French families and others from Guadeloupe settled in the north. In 1727, the first French commander, M. Le Grand, took charge of the island with a basic French government. Dominique formally became a colony of France, and the island was divided into districts or "quarters". The French had already developed plantation agriculture on Martinique and Guadeloupe, where they cultivated sugarcane with enslaved African workers. In Dominique they gradually developed coffee plantations. They imported so many African slaves to fill the labour demands that the population became predominantly African in ethnicity. In 1761, during the Seven Years' War in Europe, a British expedition against Dominica led by Andrew Rollo conquered the island, along with several other Caribbean islands. In 1763, France had lost the war and ceded the island to Great Britain under the Treaty of Paris. The same year, the British established a legislative assembly, with only European colonists represented. French remained the official language, but Antillean Creole, which had developed from it, was spoken by most of the population. In 1778 the French, with the active co-operation of the population, began the Invasion of Dominica. This was ended by the Treaty of Paris (1783), which returned the island to British control. But the island population, especially the class of free people of color, resisted British restrictions. The British retained control through French invasions in 1795 and 1805, the first taking place during the period of the Haitian Revolution, which gained the independence of Haiti (formerly Saint-Domingue, France's richest Caribbean colony). Great Britain established a small colony in 1805. It used Dominica as part of the triangular trade, by which slaves were imported and sold as labour in the islands as part of a trade that included producing and shipping sugar and coffee as commodity crops to Europe. The best documented slave plantation on the island is Hillsborough Estate, which had 71 male and 68 female slaves. The Greg family were notable: Thomas Hodgson, a brother-in-law, owned a slave ship, and Thomas Greg and his son John Greg were part-owners of sugar plantations on Dominica. In January 1814, 20 slaves absconded from Hillsborough. They were recorded as recaptured and punished with 100 lashes applied to the males and 50 for the females. The slaves reportedly said that one of their people had died in the plantation hospital, and they believed he had been poisoned. In 1831, reflecting a liberalisation of official British racial attitudes, the Brown Privilege Bill conferred political and social rights on free blacks (mostly free people of colour, who generally were of mixed race, with African and European ancestry). With the Slavery Abolition Act of 1833, Britain ended the institution of slavery throughout its empire, except in India, where it was considered part of the culture. With freedom came enfranchisement. In 1835, the first three men of African descent were elected to the legislative assembly of Dominica. Many slaves from the neighbouring French colonial islands of Guadeloupe and Martinique fled to Dominica. In 1838, Dominica became the first colony of the British West Indies to have an elected legislature controlled by an ethnic African majority. Most of these legislators had been free people of color and smallholders or merchants before the abolition of slavery. Their economic and social views were different from the interests of the small, wealthy English planter class. Reacting to a perceived threat to their power, the planters lobbied for more direct British rule. In 1865, after much agitation and tension, the colonial office replaced the elective assembly with one made up of one-half members who were elected and one-half who were appointed. Planters, who were allied with colonial administrators, outmaneuvered the elected legislators on many occasions. In 1871, Dominica became part of the British Leeward Islands. The political power of the ethnic African population progressively eroded. Crown colony government was re-established in 1896. All political rights were curtailed for people of colour and blacks, who were the overwhelming majority of the population. Development aid, offered as compensation for disfranchisement, resulted in negligible improvements in conditions for most ethnic Africans. In World War I, many Dominicans, mainly the sons of small farmers, volunteered to fight in Europe for the British Empire. After the war, an upsurge of political consciousness throughout the Caribbean led to the formation of the Representative Government Association. Marshaling public frustration with the lack of a voice in governing Dominica, this group won one-third of the popularly elected seats of the legislative assembly in 1924, and one-half in 1936. Shortly thereafter, Dominica was transferred from the Leeward Island Administration. During World War II, some Dominicans volunteered in British and Caribbean forces. Thousands of Free French refugees from Martinique and Guadeloupe escaped to Dominica from the Vichy-controlled French islands. They stayed in Roseau and other villages. Until 1958, Dominica was governed as part of the British Windward Islands. Caribbean islands sought independence from 1958 to 1962, and Dominica became a province of the short-lived West Indies Federation. After the federation dissolved, in 1967 Dominica became an associated state of the United Kingdom, and formally took responsibility for its internal affairs. On 3 November 1978, the Commonwealth of Dominica was granted independence as a republic, led by Prime Minister Patrick John. In mid-1979, political discontent led to the formation of an interim government. After the 1980 elections, it was replaced by a government led by the Dominica Freedom Party under Prime Minister Eugenia Charles. She was the Caribbean's first female prime minister. Chronic economic problems were compounded by the severe damages of hurricanes in 1979 and in 1980. In 1981, Dominica was threatened with a takeover by mercenaries in Operation Red Dog, led by Mike Perdue and Wolfgang Droege. They tried to overthrow Charles as Prime Minister and reinstall ex-Prime Minister John in exchange for control over the country's development. The FBI was tipped off, and the ship hired to transport the mercenaries never left dock. The mercenaries lacked formal military experience or training, and most of the crew had been misled into joining by the ringleader Mike Perdue. White supremacist Don Black was also jailed for his part in the attempt, which violated US neutrality laws. By the end of the 1980s, the economy recovered. It weakened again in the 1990s due to a decrease in banana prices. In the January 2000 elections, the Edison James United Workers Party (UWP) was defeated by the Dominican Labour Party (DLP), led by Roosevelt P. "Rosie" Douglas. Douglas died after only a few months in office. He was replaced by Pierre Charles, who died in office in January 2004. Roosevelt Skerrit, also of the DLP, replaced Charles as Prime Minister. Under Prime Minister Skerrit's leadership, the DLP won elections in May 2005 that gave the party 12 seats in the 21-member Parliament, to the UWP's 8 seats. An independent candidate affiliated with the DLP won a seat as well. Later, the independent candidate joined the government and one UWP member crossed the aisle, making the total 14 seats for the DLP and 7 for the UWP. In the December 2009 elections, DLP won 18 of 21 seats. UWP claimed campaign improprieties and boycotted Parliament; by-elections were conducted for two of its seats in July 2010, and the UWP again won the seats. On 17 September 2012 Eliud Thaddeus Williams was sworn in as President, replacing Dr Nicholas Liverpool who was reportedly removed from office due to ill health. On 30 September 2013, former Trade Union Leader and agitator Charles Savarin was elected President having only days before resigned as a Minister of Government. On 18 September 2017, Dominica suffered a direct landfall from Category 5 Hurricane Maria. Early estimates of damage suggested 90% of the buildings on the island had been destroyed, with infrastructure left in ruins. The UK, France and the Netherlands set up shipping and air lifts to take aid to the island; the scale of destruction having left most people homeless and desperate. Dominica is an island nation in the Caribbean Sea, the northernmost of the Windward Islands (though it is sometimes considered the southernmost of the Leeward Islands). The size of the country is about 289.5 square miles (750 km2). Dominica is largely covered by rainforest and is home to the world's second-largest hot spring, Boiling Lake. Dominica has many waterfalls, springs, and rivers. The Calibishie area in the country's northeast has sandy beaches. Some plants and animals thought to be extinct on surrounding islands can still be found in Dominica's forests. The island has several protected areas, including Cabrits National Park, as well as 365 rivers. Morne Trois Pitons National Park is a tropical forest blended with volcanic features. It was recognised as a World Heritage Site on 4 April 1995, a distinction it shares with four other Caribbean islands. 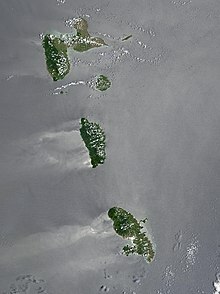 The Commonwealth of Dominica is engaged in a long-running dispute with Venezuela over Venezuela's territorial claims to the sea surrounding Isla Aves (literally Bird Island, but in fact called Bird Rock by Dominica authorities), a tiny islet located 140 miles (225 km) west of the island of Dominica. There are two primary population centres: Roseau (with 14,725 inhabitants in 2011) and Portsmouth (with 4,167 inhabitants in 2011). Dominica, known as "The Nature Island of the Caribbean" due to its spectacular, lush, and varied flora and fauna, which are protected by an extensive natural park system; the most mountainous of the Lesser Antilles, its volcanic peaks are cones of lava craters and include Boiling Lake, the second-largest, thermally active lake in the world possesses the most pristine wilderness in the Caribbean. Originally, it was protected by sheer mountains which led the European powers to build ports and agricultural settlements on other islands. More recently,[when?] the citizens of this island have sought to preserve the natural environment by discouraging the type of high-impact tourism which has damaged nature in other parts of the Caribbean. Visitors can find large tropical forests, including one which is on the UNESCO list of World Heritage sites, hundreds of streams, coastlines and coral reefs. Dominica is home to local artisans and traditional craftsman who cater to tourists, although not a thriving high end art scene. The Sisserou parrot (Amazona imperialis) is Dominica's national bird and is endemic to its mountain forests. A related species, the Jaco or red-necked parrot (A. arausiaca), is also a Dominican endemic. Both birds are rare and protected, though some forest is still threatened by logging in addition to the long-standing threat of hurricanes. The Caribbean Sea offshore of the island of Dominica is home to many cetaceans. Most notably a group of sperm whales live in this area year-round. Other cetaceans commonly seen in the area include spinner dolphins, pantropical spotted dolphins and bottlenose dolphins. Less commonly seen animals include killer whales, false killer whales, pygmy sperm whales, dwarf sperm whales, Risso's dolphins, common dolphins, Atlantic spotted dolphins, humpback whales and Bryde's whales. This makes Dominica a destination for tourists interested in whale-watching. Dominica is especially vulnerable to hurricanes as the island is located in what is referred to as the hurricane region. In 1979, Hurricane David struck the island as a Category 4 hurricane, causing widespread and extreme damage. On 17 August 2007, Hurricane Dean, a Category 1 hurricane at the time, hit the island. A mother and her seven-year-old son died when a landslide caused by the heavy rains crushed their house. In another incident two people were injured when a tree fell on their house. Prime Minister Roosevelt Skerrit estimated that 100 to 125 homes were damaged, and that the agricultural sector was extensively damaged, in particular the banana crop. In August 2015, Tropical Storm Erika caused extensive flooding and landslides across the island. Multiple communities were evacuated and upwards of 30 people were killed. According to a Rapid Damage and Impact Assessment prepared for Dominica by the World Bank, the total damage and losses from the storm were US$484.82 million or 90% of Dominica's yearly GDP. Category 5 Hurricane Maria struck the island in 2017 and caused losses of approximately US$930 million or 226% of GDP. Dominica is a parliamentary democracy within the Commonwealth of Nations. The capital is Roseau. The Commonwealth of Dominica is one of the Caribbean's few republics. The president is the head of state, while executive power rests with the cabinet, headed by the prime minister. The unicameral parliament consists of the 30-member House of Assembly, which consists of 21 directly elected members and nine senators, who may either be appointed by the president or elected by the other members of the House of Assembly. Unlike other former British colonies in the region, Dominica was never a Commonwealth realm, instead becoming a republic on independence. Dominica is a full and participating member of the Caribbean Community (CARICOM) and the Organisation of Eastern Caribbean States (OECS). Dominica is also a member of the International Criminal Court with a Bilateral Immunity Agreement of protection for the US military, as covered under Article 98. In January 2008 Dominica joined the Bolivarian Alternative for the Americas. Graphical depiction of Dominica's product exports in 28 colour-coded categories. Dominica's currency is the East Caribbean Dollar. In 2008, Dominica had one of the lowest per capita gross domestic product (GDP) rates of Eastern Caribbean states. The country nearly had a financial crisis in 2003 and 2004, but Dominica's economy grew by 3.5% in 2005 and 4.0% in 2006, following a decade of poor performance. Growth in 2006 was attributed to gains in tourism, construction, offshore and other services, and some sub-sectors of the banana industry. The International Monetary Fund (IMF) recently praised the Government of Dominica for its successful macroeconomic reforms. The IMF also pointed out remaining challenges, including the need for further reductions in public debt, increased financial sector regulation, and market diversification. Bananas and other agriculture dominate Dominica's economy, and nearly one-third of the labour force works in agriculture. This sector, however, is highly vulnerable to weather conditions and to external events affecting commodity prices. In 2007, Hurricane Dean caused significant damage to the agricultural sector as well as the country's infrastructure, especially roads. In response to reduced European Union (EU) banana trade preferences, the government has diversified the agricultural sector by promoting the production of coffee, patchouli, aloe vera, cut flowers, and exotic fruits such as mango, guava, and papaya. The expected increase of Dominica's Citizenship by Investment (CBI) fees has been suspended with no implementation date in sight, as announced by Prime Minister Roosevelt Skerrit, in the 2016 budget speech. Dominica is a beneficiary of the Caribbean Basin Initiative (CBI) that grants duty-free entry into the United States for many goods. Dominica also belongs to the predominantly English-speaking Caribbean Community (CARICOM), the CARICOM Single Market and Economy (CSME), and the Organisation of Eastern Caribbean States (OECS). The Commonwealth of Dominica is becoming in recent years a major international financial centre. The largest sectors are "offshore banking, payment processing companies, and general corporate activities". Regulation and supervision of the financial services industry is the responsibility of the Financial Service Unit of the Commonwealth of Dominica (FSU) under the supervision of the Ministry of Finance. There are a number of service providers. These include global financial institutions including Scotiabank, Royal Bank of Canada, Cathedral Investment Bank, First Caribbean International Bank, and The Interoceanic Bank of the Caribbean. Starting in the mid-late 1990s, offshore financial centres, such as the Commonwealth of Dominica, came under increasing pressure from the OECD for their allegedly harmful tax regimes, where the OECD wished to prevent low-tax regimes from having an advantage in the global marketplace. The OECD threatened to place the Commonwealth of Dominica and other financial centres on a "black list" and impose sanctions against them. However, the Commonwealth of Dominica successfully avoided being placed on the OECD black list by committing to regulatory reform to improve transparency and begin information exchange with OECD member countries about their citizens. Dominica supposedly offers tax-free status to companies locating from abroad. It is not known how many companies benefit from the tax-free status because of the strict confidentiality the government enforces, although it is known many Internet businesses and hedge funds utilise Dominica for this reason. However, on 12 July 2012 Dominica signed an agreement with Poland to exchange tax information. The Commonwealth of Dominica offers an official and legally mandated economic citizenship to those seeking a valid second citizenship. The nationality law of Dominica authorises the government to waive the normal requirement of seven years of legal residence to acquire citizenship in exchange for an investment into their country's economy. The required contribution for a main applicant starts at US$100,000 through the Economic Diversification Fund. Alternatively, since 2014, applicants can make a US$200,000 minimum investment in pre-approved real estate from island exclusive resorts or global brands like Marriott, Kempinski or Hilton. According to officials, the citizenship by investment (CBI) programme was an economic and fiscal "lifeline" in the aftermath of Tropical Storm Erika in 2015 and Hurricane Maria in 2017, and its new investment option had become the main source of Foreign Direct Investment into Dominica by early 2016. Dominican citizens can travel without a visa, or obtain a visa upon entry, to nearly 140 countries and territories, including the United Kingdom and the Schengen Zone. Applying for Dominica citizenship requires interacting with official Government Approved Economic Citizenship Agents as the first step in the application process. This program is currently valued at 16% of the government's total revenue. The government's management of the economic citizenship programme and an initial perceived lack of transparency in the use of the revenues generated are a frequent topic of heated domestic political controversy. Referring to the opposition, Prime Minister Skerrit in 2016 stated that "If they can discredit the Citizenship by Investment Program and make Dominica an unattractive place to obtain citizenship, then revenues would fall and the government would not be able to rebuild the country. Or, the government would then have to increase taxes on the people; making itself unpopular in their sight." Since then, the Government of Dominica has improved transparency of CBI funds. According to Prime Minister Skerrit's 2018-2019 Budget Address, the island's CBI Programme has helped develop a National Health Insurance pilot that provides Dominican children in critical medical conditions with overseas treatment. Because many residents were displaced by Hurricane Maria's impact on the small Caribbean island, the government pledged to build 5,000 hurricane-proof homes, of which the first batch of 125 houses are scheduled for occupancy in February 2019. The CBI Programme also helps develop significantly the island's eco-tourism sector and creating jobs along the way. Furthermore, the Skerrit administration sets aside EC$5m every month for the construction of a new airport. The Financial Times' Professional Wealth Management publication ranked Dominica as the world's best citizenship by investment programme in its annual CBI Index. According to the FT Specialist report, investors choose Dominica's citizenship because it has the most affordable investment threshold, the application process is straightforward and streamlined, while the due diligence (i.e. the security checks each applicant is subjected to) remains very strict. Dominica is mostly volcanic and has few beaches; therefore, tourism has developed more slowly than on neighbouring islands. Nevertheless, Dominica's mountains, rainforests, freshwater lakes, hot springs, waterfalls, and diving spots make it an attractive eco-tourism destination. Cruise ship stopovers have increased following the development of modern docking and waterfront facilities in Roseau, the capital. Out of 22 Caribbean islands tracked, Dominica had the fewest visitors in 2008 (55,800 or 0.3% of the total). This was about half as many as visited Haiti. The volcanic nature of the island has attracted scuba divers. There are two regional airports on the island, but no international airports. Therefore, flying to Dominica requires travelling through San Juan, Puerto Rico or other nearby islands in the Caribbean such as Martinique, Guadeloupe, or Barbados. The primary airport, Douglas-Charles Airport (DOM), is on the northeast coast and is about a 45-minute drive from Portsmouth (1 hour from Roseau). The second is Canefield Airport (DCF), about 15 minutes from Roseau on the southwest coast. Douglas-Charles Airport is suitable for limited use of commercial jets because of runway length. Douglas-Charles currently has regular service by Air Sunshine, Winair, Seaborne Airlines and LIAT using twin turboprop aircraft like the ATR & Saab 340, as well as Conviasa and Amerijet, which, using Boeing 727 Freighters, is the only airline with jet service to the republic. A runway extension and service upgrade project began at Douglas-Charles Airport around 2006 and was finished in 2010. In March 2013, airline American Eagle halted flights to the island citing high labour costs. Dominica's road network runs primarily along the coastline and along river valleys. Major roads are two-lane highways which connect the capital, Roseau, with Portsmouth (Edward Oliver Leblanc Highway) and the Douglas Charles Airport (Dr. Nicholas Liverpool Highway). It takes about 45 minutes to drive from Portsmouth to Roseau. Private minibuses form the major public transport system. These major roads were recently reconstructed with assistance from the People's Republic of China and the European Union. Due to Tropical Storm Erika, several road surfaces and bridges were damaged by flooding and landslides, including on the newly completed E.O. LeBlanc (Roseau to Portsmouth) and Dr. Nicholas Liverpool Highways (Pont Cassé to Douglas Charles Airport). Dominica's electricity sector includes power from hydroelectricity, solar energy, and geothermal energy. The vast majority of Dominicans are of African descent. There is a growing mixed population along with a small European origin minority (descendants of French and British colonists along with some people of Irish descent) and there are small numbers of Lebanese, Syrians and Asians. Dominica is also the only Eastern Caribbean island that still has a population of pre-Columbian native Kalinago (previously called Caribs), who were exterminated or driven from neighbouring islands. As of 2014[update] there are more than 3,000 Kalinago remaining. They live in eight villages on the east coast of Dominica. This special Carib Territory (now Kalinago Territory) was granted by the British Crown in 1903. There are also about 1,000 medical students from the United States and Canada who study at the Ross University School of Medicine in Portsmouth. The population growth rate of Dominica is very low, due primarily to emigration to other countries. In the early 21st century, emigrant numbers for the most popular countries are as follows: the United States (8,560), the United Kingdom (6,739), Canada (605) and France (394). Dominica has a relatively large number of centenarians. As of March 2007, there are 22 centenarians out of the island's 70,000 inhabitants—three times the average incidence of centenarianism in developed countries. The reasons for this are the subject of current research being undertaken at Ross University School of Medicine. Dominica was partially integrated into the federal colony of the Leeward Islands in 1832. Later, in 1871, it became a full part of the Federation of the Leeward Islands. From the start it was a peculiar relationship for previously Dominica had played no part in the political or cultural traditions of the other more Anglophone islands of the federation. Now, as a Leeward Island, this much larger territory, with thousands of acres of forested unclaimed land, was open to the people of Montserrat and Antigua. At the beginning of the 20th century the Rose's Company, which produced Rose's lime juice, saw demand for its product outgrow its ability to supply the product from Montserrat. Their response to the situation was to buy land on Dominica and encourage Montserrat farm labourers to relocate. As a result, there came to be two linguistic communities in Dominica, Wesley and Marigot. In 1902, on 8 May, the Mount Pelée volcano on Martinique erupted destroying the city of Saint-Pierre. Refugees from Martinique arrived in boats to the southern villages of Dominica and some remained permanently on the island. English is the official language of Dominica and is universally spoken and understood. In addition, Dominican Creole, an Antillean Creole based on French, is widely spoken. This is due to French migration to the island starting in 1690, a majority French Creole speaking population that resided on the island, and its location between the two French-speaking departments of Martinique and Guadeloupe. Since 1979, Dominica has been a member of La Francophonie. Dominican Creole is particularly used among the older generation, which also speaks a patois language. Because of a decline in the use of Creole by the younger generation, initiatives have been set up in an effort to increase usage and promote this unique part of the nation's history and culture. Along with Creole, a dialect known as Kokoy (or Cockoy) is spoken. It is a type of pidgin English which is a mix of Leeward Island English Creole and Dominican Creole, and is mainly spoken in the north-eastern villages of Marigot and Wesley, by the descendants of immigrants from Montserrat and Antigua. Over time there has been much intermarrying, but there are still traces of difference in origin. As a result of this mixture of languages and heritage, Dominica is a member of both the French-speaking Francophonie and the English-speaking Commonwealth of Nations. 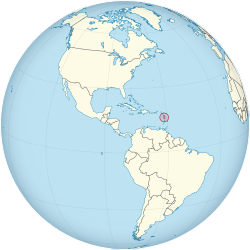 Island Carib, also known as Igneri (Iñeri, Igñeri, Inyeri), was an Arawakan language historically spoken by the Island Caribs of the Lesser Antilles in the Caribbean. The Island Caribs lived throughout the southern Lesser Antilles such as Dominica, St Vincent and Trinidad, supposedly having conquered them from their previous inhabitants, the Igneri. Island Carib became extinct about 1920, but an offshoot survives as Garifuna, primarily in Central America. 61.4% of the population is Roman Catholic, though in recent years a number of Protestant churches have been established. About 10–12% of the population belongs to one of the 7th day (Saturday) denominations, which includes Yahweh Congregation, Church of God (Seventh-Day) and the Seventh-day Adventist Church. According to the Association of Religion Data Archives, in 2010 the World Christian Database reported that the largest non-Christian religious groups included: spiritualism followed by 2.6% of the population; Bahai followed by 1.7%; Agnosticism followed by 0.5%; Buddhism, Hinduism, and Islam followed by 0.1% each; and Chinese folk religion, Neoreligions, and Atheism each followed by non-negligible (i.e. <0.1%) of the population. The nation's first mosque was built near Ross University. School in Dominica is mandatory up to secondary school. After pre-school, pupils attend primary school for six or seven years, and are admitted into secondary school on the basis of a Common Entrance Exam. After five years the students take the General Certificate of Education (GCE), widely replaced by the current Caribbean Secondary Education Certificate (CSEC or CXC) administered by the Caribbean Examination Council (a 15-member confederation of the Caribbean community (CARICOM). The more advanced version of this examination (CAPE) can be taken upon completion of two years of community college. The island has its own state college, formerly named Clifton Dupigny Community College. Some Dominicans attend universities in Cuba on scholarships offered by its government. Others go to the University of the West Indies or to universities in the United Kingdom, the United States, or other countries. Ross University, a medical school, is located at Portsmouth. Ross has been operating in Dominica since the 1980s. Archbold Tropical Research and Education Center (ATREC), a biological field station owned by Clemson University, is located at Springfield Estate between Canefield and Pont Cassé. In 2006, All Saints University School of Medicine opened in temporary facilities in Loubière, with a permanent campus being constructed in Grand Bay. 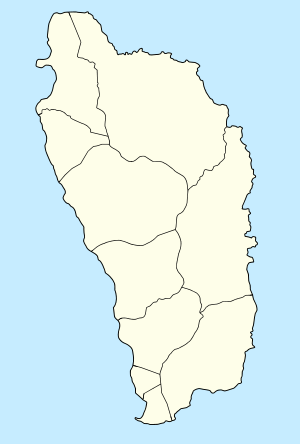 Currently All Saints is located in Roseau, Dominica. A marine biology institute in Mahaut, ITME (Institute for Tropical Marine Ecology), closed in 2009. Dominica is home to a wide range of people. Although it was historically occupied by several native tribes, the Arawaks (Tainos) and Carib (Kalinago) tribes occupied it at the time European settlers reached the island. "Massacre" is a name of a river dedicated to the murders of the Native villagers by English settlers. Both the French and British tried to claim the island and imported slaves from Africa for labour. The remaining Caribs now live on a 3,700-acre (15 km2) territory on the east coast of the island. They elect their own chief. This mix of cultures has produced the current culture. Music and dance are important facets of Dominica's culture. The annual independence celebrations display a variety of traditional song and dance. Since 1997, there have also been weeks of Creole festivals, such as "Creole in the Park" and the "World Creole Music Festival". Dominica gained prominence on the international music stage when in 1973, Gordon Henderson founded the group Exile One and an original musical genre, which he coined "Cadence-lypso". This paved the way for modern Creole music. Other musical genres include "Jing ping" and "Cadence". Jing ping features the accordion and is native to the island. Dominica's music is a melange of Haitian, Afro-Cuban, African and European traditions. Popular artists over the years include Chubby and the Midnight Groovers, Bells Combo, the Gaylords, WCK, and Triple Kay. The 11th annual World Creole Music Festival was held in 2007, part of the island's celebration of independence from Great Britain on 3 November. A year-long reunion celebration began in January 2008, marking 30 years of independence. Dominica is often seen as a society that is migrating from collectivism to that of individualism. The economy is a developing one that previously depended on agriculture. Signs of collectivism are evident in the small towns and villages which are spread across the island. The famed novelist Jean Rhys was born and raised in Dominica. The island is obliquely depicted in her best-known book, Wide Sargasso Sea. Rhys's friend, the political activist and writer Phyllis Shand Allfrey, set her 1954 novel, The Orchid House (ISBN 0-8135-2332-X), in Dominica. Much of the Walt Disney film Pirates of the Caribbean: Dead Man's Chest (the second in the series, released on 7 July 2006), was shot on location on Dominica (though in the film it was known as "Pelegosto," a fictional island), along with some shooting for the third film in the series, At World's End (released on 2 May 2007). Dominica's cuisine is similar to that of other Caribbean islands, particularly Jamaica, Saint Lucia and Trinidad and Tobago. Like other Commonwealth Caribbean islands, Dominicans have developed a distinct twist to their cuisine. Breakfast is an important daily meal, typically including saltfish, dried and salted codfish, and "bakes" (fried dough). Saltfish and bakes are combined for a fast food snack that can be eaten throughout the day; vendors on Dominica's streets sell these snacks to passersby, together with fried chicken, fish and fruit and yogurt "smoothies". Other breakfast meals include cornmeal porridge, which is made with fine cornmeal or polenta, milk and condensed milk and sugar to sweeten. Traditional British-influenced dishes, such as eggs, bacon and toast, are also popular, as are fried fish and plantains. Common vegetables include plantains, tanias (a root vegetable), yams, potatoes, rice and peas. Meat and poultry typically eaten include chicken (which is very popular), beef, and fish. These are often prepared in stews with onions, carrots, garlic, ginger and herbs like thyme. The vegetables and meat are browned to create a rich dark sauce. Popular meals include rice and peas, brown stew chicken, stew beef, fried and stewed fish, and many different types of hearty fish broths and soups. These are filled with dumplings, carrots and ground provisions. Cricket is a popular sport on the island, and Dominica competes in test cricket as part of the West Indies cricket team. In West Indies domestic first-class cricket, Dominica participates as part of the Windward Islands cricket team, although they are often considered a part of the Leeward Islands geographically. This is due to being part of the British Windward Islands colony from 1940 until independence; its cricket federation remains a part of the Windward Islands Cricket Board of Control. On 24 October 2007, the 8,000-seat Windsor cricket stadium was completed with a donation of EC$33 million (US$17 million, €12 million) from the government of the People's Republic of China. Netball, basketball, rugby, tennis and Association football are gaining popularity as well. During the 2014 Winter Olympics, a husband and wife team of Gary di Silvestri and Angela Morrone di Silvestri spent US$175,000 to register as Dominican citizens and enter the 15 km men's and 10 km women's cross-country skiing events, respectively. Angela did not start her race, and Gary pulled out several hundred meters into his race. To date, they are Dominica's only Winter Olympic athletes. Dominica has two major newspapers, The Sun and The Chronicle. There are two national television stations and a few radio stations, including Stations include: ZBC-AM 590, the first private local radio station is called Radio En Ba Mango 93.5/96.9FM in the Village of Berricoa Grand Bay and is owned by Urban Dangleben, ZGBC-AM 740, ZGBC-FM 90.7 (Portsmouth), ZGBC-FM 102.1 (Roseau) and ZGBC-FM 106.1 (Marigot), Q95 FM, the Dominica Broadcasting Corporation, and Kairi FM. Before 2004, there were two telecommunication companies Cable and Wireless and Marpin TV founded by Dominican, Ronald Bernard Maroni Abraham. In 2005, Digicel and a UK-based company Orange started to offer service to the island. There are a number of mobile networks operating on the island; LIME and Digicel compete for most of Dominica's wireless customers. Orange shut down in 2010 and is no longer operating on the island of Dominica. ^ "Coat of Arms – Government of the Commonwealth of Dominica". www.dominica.gov.dm. ^ "Dominica Ethnic groups 2001 Census". Cia.gov. Retrieved 29 September 2013. ^ Pew Forum Research Data 2010 Archived 24 September 2015 at the Wayback Machine Page 46. December 2012. Retrieved 28 May 2017. ^ a b "2011 POPULATION AND HOUSING CENSUS" (PDF). Dominica.gov.dm. Retrieved 29 August 2017. ^ a b c d "Dominica". International Monetary Fund. ^ "2015 Human Development Report" (PDF). United Nations Development Programme. 2015. Retrieved 14 December 2015. ^ "One woman's fight to get David Dimbleby to correctly pronounce Dominica". the Guardian. 12 November 2014. ^ a b c d "Dominica's Constitution of 1978 with Amendments through 1984". Constitute. Retrieved 20 July 2016. ^ P. C. Evans & L. Honychurch, Dominica: Nature Island of the Caribbean. Hansib (1989). ^ "Country Flags With Purple". World Atlas. Retrieved 3 April 2019. ^ "Discover Dominica: an introduction to our Caribbean island". Dominica.dm. Archived from the original on 23 September 2010. Retrieved 2010-06-27. ^ a b c d e f g h i j k l "Background note: Dominica". U.S. Department of State (July 2008). This article incorporates text from this source, which is in the public domain. ^ "Important Dates in Dominica's History". Lennox Honychurch. 5 July 1990. Archived from the original on 30 August 2013. Retrieved 29 September 2013. ^ "Janus: Dominica Estate documents". janus.lib.cam.ac.uk. ^ London Society for the Abolition of Slavery throughout the British Dominions (1831). Anti-Slavery Monthly Reporter, volume 3. ^ "The Dominica Termination of Association Order 1978". www.legislation.gov.uk. ^ "Caribbean Islands – Regional Security Threats, 1970–81". Country-data.com. Retrieved 27 June 2010. ^ Stewart Bell, Bayou of Pigs, presents the story of the planned coup. ^ "U.S. Department of State Background Note on Dominica". State.gov. 7 February 2013. Retrieved 29 September 2013. ^ "Hurricane Maria 'devastates' Dominica: PM". BBC News. 19 September 2017. Retrieved 19 September 2017. ^ "Dominica devastation emerges with fatalities and '90% of buildings destroyed'". WIC News. 19 September 2017. Retrieved 19 September 2017. ^ a b Handy, Gemma (25 September 2017). "Dominica grieves after Hurricane Maria". BBC News – via www.bbc.com. ^ "Between Two Reunions: Boiling Lake, 1988 to 2008 |". The Government of the Commonwealth of Dominica's Official Website. Retrieved 27 June 2010. ^ "A Photo Tour of the Calibishie Coast". Calibishiecoast.com. Retrieved 29 September 2013. ^ Stephen Durand and Bertrand Jno. Baptiste, "Dominica" (Forestry, Wildlife and Parks Division). ^ "Morne Trois Pitons National Park by World Heritage Sites". Whc.unesco.org. 7 December 1997. Retrieved 27 June 2010. ^ St. Lucia (2004), Saint Kitts (1999), Hispaniola (Dominican Republic /Haiti ) and Cuba (multiple). ^ Carlyle L. Mitchell; Edgar Gold; Dalhousie Ocean Studies Programme (1983). Fisheries Development in Dominica: An Assessment of the New Law of the Sea Implications and Strategies. Dalhousie Ocean Studies Programme, Dalhousie University. p. 41. ISBN 978-0-7703-0280-1. Retrieved 8 October 2010. ^ Thompson, Keith (2010). Life in the Caribbean. New Africa Press. p. 288. ISBN 978-9987160150. ASIN 9987160158. p.173. ^ "Hurricane claims one life in St. Lucia and possibly two in Dominica". CBC. 17 August 2007. Archived from the original on 28 August 2007. Retrieved 17 August 2007. ^ "Dominica Badly Affected". CBC. 17 August 2007. Archived from the original on 28 August 2007. Retrieved 17 August 2007. ^ "Dominica pleads for help as storm death toll tops 30". Yahoo News. 1 September 2015. Retrieved 4 October 2015. ^ "Rapid Damage and Impact Assessment: Tropical Storm Erika" (PDF). Government of Dominica. 25 September 2015. Retrieved 4 October 2015. ^ "(Dominica 07/08, U.S. State Dept.)". ^ "(World Bank 'At A Glance')" (PDF). ^ a b "Haven or havoc?". Pbs.org. Retrieved 31 July 2011. ^ "Ministerstwo Finansów". Mf.gov.pl. Retrieved 29 September 2013. ^ "Economic Diversification Fund - Dominica". Dominica. Retrieved 30 November 2018. ^ "Dominica’s Citizenship Programme 'Main Source of FDI', Officials Say", Dominica News Online, 16 February 2016. ^ "Dominica Passport Visa Free Travel - Dominica Visa Free Countries". www.goccp.com. Retrieved 30 November 2018. ^ "Authorised CBIU Agents – Government Approved CBIU Agents". ^ "Selling citizenship is big business—and controversial". The Economist. 29 September 2018. ^ "Full speech of PM Skerrit at DLP meeting in St. Joseph", Dominica News Online, 3 February 2016. ^ "Full budget speech of Prime Minister Roosevelt Skerrit – Dominica News Online". dominicanewsonline.com. Retrieved 30 November 2018. ^ "First phase of CBI-funded housing projects ready for occupation in February 2019 – Dominica News Online". dominicanewsonline.com. Retrieved 30 November 2018. ^ "How Dominica's CBI is Changing the Lives of its Citizens - Dominica". Dominica. 6 August 2018. Retrieved 30 November 2018. ^ "Land acquisition begins for international airport – PM Skerrit – Dominica News Online". dominicanewsonline.com. Retrieved 30 November 2018. ^ "Getting over Hurricane Maria". The Economist. Retrieved 30 November 2018. ^ "CBI Index | Rankings of the Best Programmes". cbiindex.com. Retrieved 30 November 2018. ^ Team, CBI Index Research. "The CBI Index: key findings - Caribbean continues to dominate". www.pwmnet.com. Retrieved 30 November 2018. ^ S-RM, Heyrick Bond Gunning, CEO of. "The CBI Index: the due diligence process in the Caribbean". www.pwmnet.com. Retrieved 30 November 2018. ^ DeLollis, Barbara; Hansen, Barbara (19 January 2009). "Bookings started to fall along with stock market". USA Today. ^ "American Eagle worries". Dominica News Online. Retrieved 29 September 2013. ^ "Completion ceremony of Edward Oliver Leblanc Highway Friday". Dominica News Online. Retrieved 29 September 2013. ^ "Dr Nicholas Liverpool Highway Officially Commissioned". Dominica Government Information Service. Retrieved 4 October 2015. ^ "Emergency bridges being developed PM says". Dominica News Online. Retrieved 4 October 2015. ^ "Emergency Bridges Being Developed PM Says". Dominica News Online. ^ "The Carib Indians". Avirtualdominica.com. Retrieved 27 June 2010. ^ Pickford, John From Our Own Correspondent BBC Radio 4. First broadcast 31 March 2007. Dominica report 17'49" – 22'55"
^ Honychurch, Lennox (1995). The Dominica story : a history of the island (3rd ed.). London: Macmillan. pp. 49–60. ISBN 978-0333627761. ^ Schreier, D; et al. (2010). Lesser-known varieties of English. Cambridge University Press. ISBN 9780521710169. ^ "Creole for Beginners". Avirtualdominica.com. Retrieved 27 June 2010. ^ "Migration from Montserrat to Dominica". Lennoxhonychurch.com. Archived from the original on 11 May 2011. Retrieved 27 June 2010. ^ "Tropical Islam". Arabwashingtonian.org. Archived from the original on 5 September 2009. Retrieved 27 June 2010. ^ "The Association of Religion Data Archives | National Profiles". www.thearda.com. Retrieved 16 October 2017. ^ "Ross University School of Medicine, Dominica". Rossu.edu. Retrieved 29 September 2013. ^ "Clemson University ATREC". 2012. Retrieved 7 October 2012. ^ "Clemson University". Clemson.edu. 8 January 2010. Retrieved 27 June 2010. ^ "All Saints University School of Medicine, Dominica". Retrieved 7 October 2012. ^ Hubbard, Vincent (2002). A History of St. Kitts. Macmillan Caribbean. p. 17. ISBN 9780333747605. ^ McKenna, Dave (24 February 2014). "Dominica's Fake Ski Team Scammed The Olympics And The Press". Deadspin. Retrieved 25 February 2014. ^ "Q95 FM". Wiceqfm.com. Retrieved 27 June 2010. ^ "Kairi FM". Kairi FM. Retrieved 27 June 2010. Official website of the Government of the Commonwealth of Dominica. Discover Dominica: Nature Island of the Caribbean, official government tourism website by the Discover Dominica Authority. This page was last edited on 5 April 2019, at 21:11 (UTC).